When the gun sounds to start the AYC Lake Pleasant Fall Race Series on Saturday, September 24, there will be two new fleets on the starting line—and apparently two fleets consolidated into other fleets. Let me explain. Tony Chapman and Viper headed for the shipping lanes. Both the Viper 640s and the Merit 25s have been flirting with the magic five-boat minimum entries the last couple years. 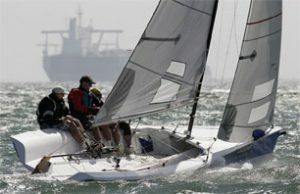 Fleets that get five entries become “active” fleets, eligible for scoring, participation in the club championship races and voting seats at the table for the fleet captains’ meetings. While the Merits were once a 9-10-boat fleet, Captain Roger Butterwick says this next year they won’t be able to come up with five entries and will instead become part of the PHRF Spinnaker Fleet. The Vipers managed five entries last year, but Charles Kaye has sold his boat. PHRF Sport Boat Fleet. What’s a “Sport Boat”? We’ve defined it as an asymmetrical spinnaker, monohull boat. The fleet became possible when three and possibly four J/80s promised to join the action. From PHRF Non-Spin come new J/80 competitors Peter Hartleb, Chris Smith and me, Mike Ferring. Chuck Moretti has owned a J/80 that’s been bobbing up and down in a slip at Pleasant Harbor Marina that will now have sisters to race with. Chuck has joined the club and hopes to make at least two races this fall before racing more regularly in the spring. Then there are the Vipers, Tony Chapman, Greg Jackson, Laurent Dion and maybe Mike Leal. And now that Spin champ Dave Christensen has sold his J/24, he says he’ll finally bring that Mini 650 out of the garage and onto the water. Green Fleet. Rob Gibbs has decided to spearhead a revival of the former Challenger Fleet, but with a few twists. He’ll encourage new competitors, just as the Challenger Fleet did, but there will be even less emphasis on competition and more emphasis on having fun on the water. Coolers and kids encouraged. No protests. And—get this—no scoring. Registration is now open for all fleets at both Lake Pleasant and Tempe Town Lake. TTL’s opening day is Sunday, September 11 and LP’s is Saturday, September 24. For questions about the Sport Boat fleet, contact Mike Ferring. For the Green Fleet, check with Rob Gibbs.